I feel like dancing around and singing "I did it, I did it" like Dora the Explorer (okay, you can tell I have grandkids), the Truck Quilt is complete as of this morning! 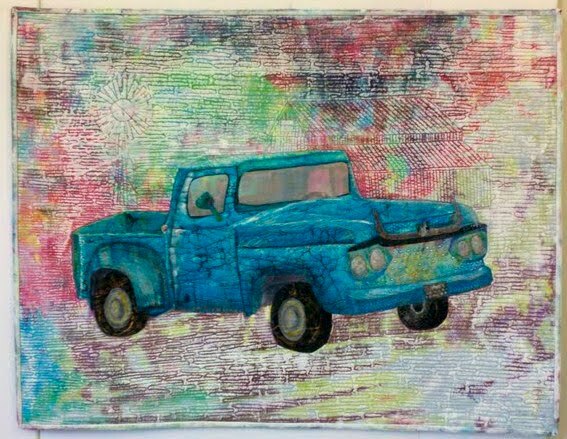 I love the surface technique of painting over the background fabric to calm it down, show the quilting of the windmill and barn and make the truck pop out. To make sure I didn't get paint on the truck, I taped it off before I painted the background. I learned this technique from "The Painted Quilt" by Linda and Laura Kemshall. The Kemshall's also demo'd this technique on one of the Quilting Arts TV Series 200 Episodes. I can't wait to use this technique again. The Dallas Area Fiber Artists are having their annual show at The Pointe ~ C.C. Young the month of March. Tonight is our monthly meeting and tomorrow I will hang the show. This year we are honored to also show the SAQA-Texas Mini-Quilt Exhibit from the 2010 International Quilt Festival in Houston. If you are in the Dallas area, join us for our "Meet the Artists" night on March 8th, 6:30pm - 7:30pm. If you can't make it then, make time to go my The Pointe and see the exhibit. Kathy Mayhew and I will be presenting a program on SAQA and the Mini-Quilts at the DAFA April program.